Each fall, the Turkey Vultures return. Often roosting in roadside evergreens, they may be drawn there by area's wealth of carcasses of deer, squirrel, possum, and other creatures fallen victim to the car. Some also get a seasonal treat. 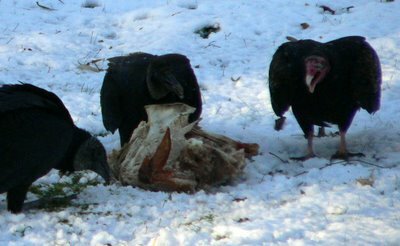 At least one family places the family turkey, picked clean after Thanksgiving dinner, in the back yard each year. Like clockwork, the vultures appear to pick it even cleaner. In the air, few birds can match the vulture’s beauty. They glide for miles on outstretched, six-foot wings that rarely flap – soaring, angling, dipping, and rocking, all as effortlessly as a goldfish in a pool. Sliding over the treetops as they approach their roost, they are like so many 747s arriving at an airport. Close-up and on the ground, however, the vulture looks like a character from a horror movie. With the black body of a fat undertaker, the huge bird bears a featherless, big-beaked, red-fleshed head – all the better to dip into the corpses with. Sometimes beauty is not only in the eye, but in the distance of the beholder.